Welcome to the Otto-Eldred Elementary School! Located in the heart of beautiful Eldred, Pennsylvania, surrounded by rolling foothills and picturesque natural scenery, the Otto-Eldred Elementary School serves pre-K through sixth grade students in the Eldred, Duke Center, and surrounding community area locations. We hope you enjoy browsing our website to get to know our school better. Whether you’d like to contact a teacher, check grades, find information about the PTO, or learn more about our programs, you’ll find all that and much more on this site. It is my distinct privilege to have the opportunity to serve as elementary principal of the Otto-Eldred Elementary School. The young children that walk through our doors daily are our future. Watching them learn and grow by exploring with their peers is truly an honor! Here at Otto-Eldred we promote a collaborative approach to learning and growing, all while putting the safety of our student first. Students are exposed to a rigorous curriculum, technology, exposure to career readiness, and so much more. 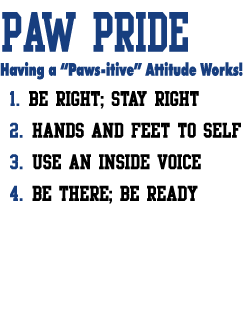 We also promote a positive culture by upholding important character traits through our school wide PAW PRIDE program. Creating lifelong learners requires a partnership with parents! I encourage you to call or stop in with any questions you may have regarding your child’s educational program. If you are interested in getting involved, we can provide you with options of how to do so. PSSA testing for students in 3rd through 6th grades will take place in April. Otto-Eldred Elementary School will be holding summer school for kindergarten through 5th grades. Otto-Eldred School District will again be participating in the National Summer Feeding Program from Monday, June 10 through Thursday, August 1. Are you having trouble getting your child to school? Are you looking for ways to increase communication with your child?